US officials are already suggesting that Mottaki’s proposal — which would see Iran immediately part with one-third of the low-enriched uranium (LEU) requested by the five Security Council nations and Germany (P5+1) — is a deal-breaker. As we near President Obama’s end of year deadline for Iran to accept a proposal to — get this — immediately surrender 75% of its LEU for a whole year without a reciprocal swap of higher-enriched uranium “guaranteed” by our side, one wonders why this intransigence on our part? Surely a deal that begins an era of Iranian cooperation and concessions on the contentious nuclear issue is far more desirable than winning a staring match? And if this opportunity is lost, can we genuinely claim to know the range of consequences we may face down the line? A Washington Post article in 2001 revealed that in 20 meetings over three years, the US met with Taliban officials to broker a deal delivering Osama bin Laden to US courts for trial. The Taliban needed a “face-saving” way to do this deal, asking for evidence of bin Laden’s crimes and insisting he be sent to a Muslim country for trial instead. Shortly after 9-11, the Taliban softened their demands significantly, dropping the requirement of evidence and agreeing to send bin Laden for trial to a third country. But by then, President Bush’s rhetoric was unstoppable. As US bombs rained on Afghanistan, the swagger went into full swing: “You’re either with us or against us.” We’re going “to smoke them out of their caves.” Entreaties by the Taliban were “non-negotiable.” And the one that magically absolved Bush from ever publically explaining any connection between bin Laden and 9-11: “There’s no need to discuss innocence or guilt. We know he’s guilty.” The Taliban offer, it seems, was dismissed. A year later, Bush was gearing up for an invasion of Iraq, alleging that Iraqi President Saddam Hussein harbored Weapons of Mass Destruction (WDM) and had links to Al Qaeda – charges that have since been proven false. “Saddam Hussein and his sons must leave Iraq within 48 hours,” was the non-negotiable ultimatum laid on the table. “Their refusal to do so will result in military conflict,” the US president said on March 18, 2003, one day before launching war on Iraq. During the lead up to the Iraq war, the US swagger threatened its relationships with longtime partners, supporters and strategic allies — from the UN, IAEA and countless weapons, terrorism and legal experts to France and Germany — refusing to heed any evidence that suggested Iraq did not have WMDs. “The Iraqi side has consistently told us that every time they move on an issue, the goal post gets changed,” a South African weapons expert said before the invasion. Eight years after our troops were first sent into Afghanistan and then Iraq, US casualties are double the number that perished in the attacks of 9-11, an ill-afforded $2 trillion will have been spent on military adventures in the region by the time US troops begin their promised 2011 withdrawal, and several hundred thousand innocent Afghani and Iraqi men, women and children have been killed in wars that have become increasingly difficult to justify to a skeptical American public. Could we have dropped just enough bombs on Taliban strongholds to negotiate a deal over Bin Laden then withdraw our fighter jets? Shouldn’t we have let weapons inspectors exhaust their mandate in Iraq before initiating military strikes? Why has drawing an incendiary “line in the sand” become the one-size-fits-all solution to our foreign policy challenges? If Mottaki’s offer is a real one backed by the Iranian government, do we seriously have the right to dismiss it because it doesn’t meet our “non-negotiable” conditions? Can we assure ourselves and the global community five or ten years down the line that this was the right thing to do? Say for instance that diplomatic initiatives between the P5+1 and Iran break down irretrievably over this macho posturing, and all other diplomatic tracks are thereafter scuttled. Iran tries to save face domestically by announcing an additional ten enrichment facilities (done), Israel bombs Iran’s main Natanz enrichment facility as they have been itching to do for years (promised), and the whole Middle East destabilizes overnight. Guess who will have to send troops in to sort things out. Diplomacy is a marathon, not a sprint. Thirty years of tensions will not be resolved in three months. Concessions must be made by all parties. And here’s the kicker: strike a deal on the nuclear issue and suddenly Iran opens up to us as a useful player in the Middle East. We can work with them to diffuse situations in Afghanistan, Iraq, Yemen, Lebanon and Palestine, for starters. Iran opposed the Taliban’s rule in Afghanistan well before we did, and its relationships with tribal chiefs and Shiite leaders in the war-torn country can be of immense use to us. Iran and the Shiite communities it supports throughout the region have been on the receiving end of terror attacks by the same type of Salafi extremist groups that have targeted US interests for years. Behold, common ground. Finally, many analysts believe that US-Iranian strategic cooperation can help trigger a liberalizing effect on the Islamic Republic’s domestic situation. Two, three, four birds with one stone. So what’s it going to be? Strike an enlightened compromise behind the scenes and risk the temporary neocon-fueled media storm that will undoubtedly erupt over how America has been “weakened?” Or forge a deal with an increasingly influential Iran — the 120-nation Non-Aligned Movement supports Iran’s nuclear enrichment program — and change the face of the Middle East? 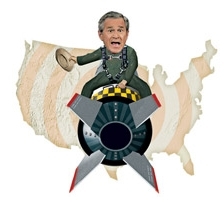 The “Swagger” alternative is a disaster, and we will be left with another “Coalition of the Willing” – Bush’s name for the 48 countries that supported his 2003 invasion of Iraq – with nations like Tonga, Slovakia, Rwanda and Albania watching our backs. Note: For an excellent article about why short-sighted tactics will not work on the Iranian nuclear issue, read this piece by Thomas Pickering, Jim Walsh and William Luers. ← Thomas Friedman — Hasbara GrandMaster Or Elitist Dupe?